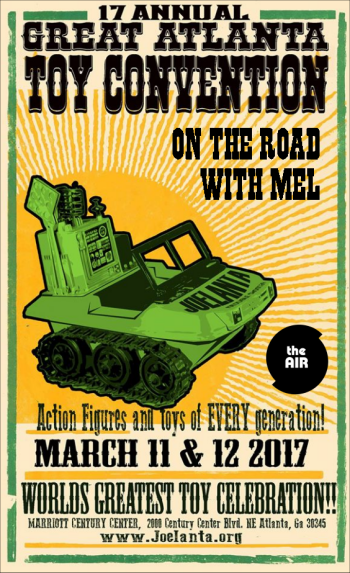 It’s a special episode of On The Road with Mel at 1 PM, as Mel is joined by your PopCulteer to preview our trip this week to Atlanta for JoeLanta and The Great Atlanta Toy Convention. It’s entirely likely that, if you are a regular reader of PopCult, you may have heard of this paticular toy show. Mel and Rudy talk at length about all the cool things happening this weekend at the Marriott Century Center in Atlanta–the dealers, the dioramas, the panels, the parachute drop, the Radio Cult concert and much, much more. Tune in for this special episode while you can, because it will not be rerun after this week. We do plan to record a new JoeLanta show while we’re down there. If you want to listen to this show at your leisure, go to The AIR website and click the “Podcasts” tab on the left side of the page. This will take you to a page where you can find this special episode of On The Road with Mel. On Life Speaks, this week at 1:30 PM we bring you part three of Michele’s appearance on the nationally-heard radio program Behind The Paranormal with Paul and Ben Eno. This show originates from Boston and can be heard online on OnWorldwide,com Radio. Michele discussed her book, Rain No Evil and her encounters with the unexplainable that lead her to create Life Speaks.